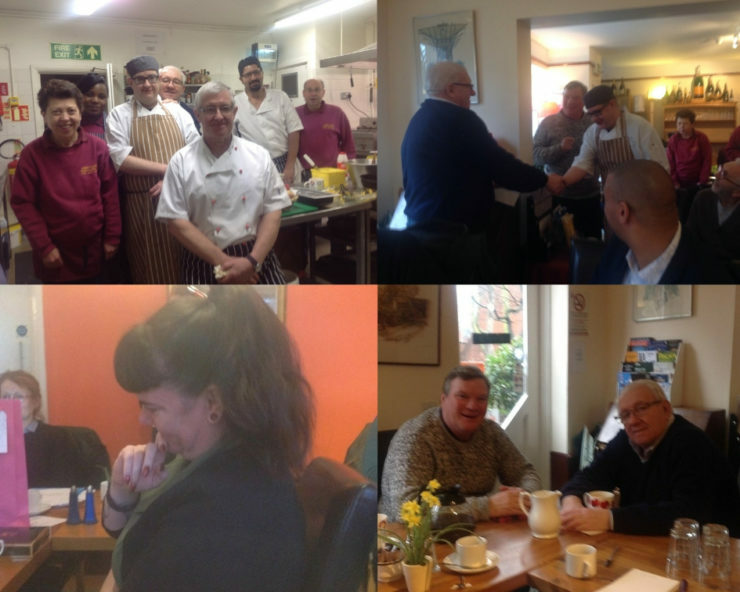 Members said goodbye to some key workers at its first meeting of 2019 at Collaborative Breakfast HQ, First Step Trust’s Abbevilles Restaurant in Clapham. •Luigi Wegrzynek, Abbevilles’ maestro chef, with brother Antony, have been supporting and creating opportunities for people with mental health issues/learning disabilities, for some 20 years at the restaurant. Luigi had probably dished up some 3,000 breakfasts since the Collaborative started in 2010 (and fuelling its discussions!) estimated Chair David Monk, thanking him and wishing him well for the future. The First Step Trust project had created a workforce to be proud of that Luigi paid tribute to, “they are human and not just a box to tick,” he said, emphasising the struggles that people had overcome to serve up the best food in Lambeth and beyond. Stacey Hemphill is also leaving as Manager of the Living Well Network Hub. Stacey has been instrumental in so much of the transformation work in Lambeth over the last few years, working to set up and run the Hub and pioneer a new open-door, asset-based approach to supporting people with mental health issues. So much of the success of the Hub is down to her passion, creativity and commitment, which was highlighted by the evaluation team presenting the third year report (see below). The Collaborative thanked her for all she has done for Lambeth. • The evaluation was funded by GST (Guys & St Thomas’) Charity and the emphasis was on being able to identify learning for further developments in Lambeth and the Living Well Network Alliance. • It used a ‘participatory evaluation’ methodology based on coproduction principles i.e. researchers work alongside other key stakeholders to design, carry out and interpret findings. • One of the notable lessons from this process was how it facilitated open and honest consideration about challenges and identifying priorities for improvement. • In year three, the LWN Hub had 6388 introductions (532 a month), which is an increase of 12.5% compared to year 2 and far exceeds the original aim of 1500 introductions in year 3. • People were introduced for a wide range of social and clinical reasons, with 57% of people introduced by their GP and 11% of people introducing themselves. • Ethnicity was not recorded for 41% of people seen by the Hub in year 3. • The average cost per person introduced to the Hub was £76, which is significantly less than initial assessment costs in IAPT and community mental health teams. Therefore the Hub provides comparatively low-cost, high-volume support. • The introduction of the Hub led to a statistically significant reduction in referrals to the Assessment and Liaison team in SLaM – around a 20% reduction compared to what otherwise would have been expected. • People rated their problems as less severe following support from the Hub, according to the Hub Outcome Profiles (HOPs) scale. • There were mixed responses to the client satisfaction questionnaire, with satisfaction rates dropping compared to years one and two. Overall, a small majority of people report being satisfied with the Hub and support given. • Staff felt that they were working according to the ‘ways of working’ model although ratings have fallen since year 2, likely because of increased demand and changes being made to services in Lambeth which would directly affect the Hub. • Feedback from wider stakeholders highlighted positive areas (Hub staff, support offered, accessibility of help and communication and information sharing) as well as areas for improvement (communication problems and service related problems such as waiting times and pathways). o To build on the learning of the LIFT CMHT and LIFT GP Prototypes. • Adrian McLachlan asked whether there was any indication of where demand would level off and also emphasised that it was important to address the data system interface issues. • Sarah Corlett commended the level of detail and honesty in the report, suggesting that this is unusual and vital to be able to meet people’s needs. • She also suggested that we cannot underestimate the impact of austerity on the increase in demand and that it would be useful to do a deep dive into the group of people who aren’t satisfied with the LWN Hub offer. • There was some discussion also on the need to address the issue of ethnicity collecting. This is included in the recommendations and there is work in training to improve the process for ethnicity information to pull through from GP referrals. Following the LWN Hub evaluation discussion, Neil Robertson discussed the Living Well Network Alliance. He suggested that instead of discussing today, a more substantial update is given at the next breakfast meeting as more information will be available at this point. David Monk asked how the learning from the Hub evaluation will be embedded going forward, especially around the issue of culture and practice for staff. Neil suggested that this is an important consideration and that the treatment teams in SLaM would like to learn from the experience of the Hub. He emphasised that while the structure of the Hub will not continue, the function will be contained within the new service arrangements. Stef Abrar updated on the suicide prevention plan development in Lambeth. The suicide prevention strategy was agreed in June 2018, with a one year action plan. Quarterly update meetings were put in place, with the first one of these happening in September. The next quarterly meeting is on 15 January from 10 – 12 at Lambeth Town Hall and all Collaborative members are invited. Stef highlighted a larger stakeholder event on 21 March from 9.30 – 12.30, which is focusing on developing an action plan for next year and opened up the invite to the Collaborative. The Collaborative also discussed suicide prevention training for staff. This year staff from the LWN Hub received this training but there is a desire to broaden this out. Stef suggested that there are also other potential approaches, for example developing suicide prevention champions, where people raise awareness within own organisations. Adrian suggested that we need to consider what our response is for the group of people who are affected by suicide, including family and friends as well as staff. Soumitra highlighted that most people who complete suicide are not known to secondary care but have been seen by GPs in last year, therefore the importance of training and awareness for GPs is vital. Lee Elliott updated on the Sanctuary’s activity in December. There were 80 attendances from 20 individuals. There were 14 referrals, 10 new and 4 repeat. In December, the sanctuary looked at repeat users and how they could potentially be supported to move on and there were a notable number of people with substance misuse issues. In terms of the impact of the sanctuary, people rated themselves 4/10 on a wellbeing scale on entering the sanctuary and 7/10 on leaving. Lee also updated that new inductions to Mosaic are starting again on Tuesday 15 January and the next LWN Open Morning will be on 31 Jan 11am – 12.30 at Mosaic, focussing on peer support. Karen Hooper updated on the Lambeth Peer Support Network. They are currently meeting monthly at Coffee Lover’s Cafe and there will be a focused session with the group in February, ahead of a presentation to the Collaborative in March/April. Harriet Ballantine and Natalie Creary updated on Black Thrive. Neil Robertson had joined the steering committee this month and updated that there were positive developments around the front door services. Emphasised that it is important to consider and resolve the issue highlighted in the LWN Hub evaluation around the high percentage of ethnicity that is not collected. SLaM Service User and Carer Advisory group. Alice Glover asked to have a regular update at the Collaborative for the SLaM service user and carer advisory group, which the Collaborative approved. Stef updated that the Time to Change application was not successful unfortunately. Only 2 applicants were chosen in the London area and there will be feedback in late January. Time to Change made an offer to Lambeth to become an ‘organic hub’, but it was highlighted that this involved no funding so may be challenging. However, Stef updated that she has already recruited 20 Time to Change champions and made plea for other organisations to do this too.